City Coach was formed in 2000 as a partnership between elite athlete Christopher Bergland, and his long-time coach Jonathan Cane. Jonathan – better known as Coach Cane – remains the Head Coach, and Christopher serves as a consultant, while focusing on his work as an author and blogger for Psychology Today. We work with a wide variety of runners and multisport athletes, ranging from beginners to World Champions. 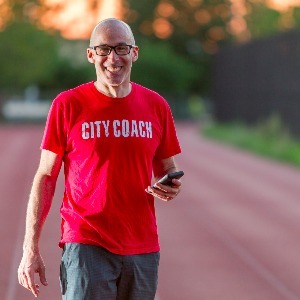 I am the co-founder of City Coach Multisport, and have been coaching endurance athletes for over twenty-five years. I have a Masters Degree in Exercise Physiology and have past or current certifications from the American College of Sports Medicine, the National Strength and Conditioning Association, and USA Cycling. I have coached for JackRabbit since 2004 and coached for Nike from 2002-2014. In addition, I am the co-author of The Complete Idiot’s Guide to Weight Training and has written for Metro Sports Magazine, NY Runner and Triathlete Magazine. I have been a featured speaker for Nike, New York Road Runners Club, Chelsea Piers Triathlon Club, The Hospital for Special Surgery, and TRIARQ. I am passionate about helping athletes meet their goals. I am proud to work with athletes of all ages and abilities. All I ask is that you're serious about improving. Success. Coach Jonathan Cane has been notified of your message.